Nearly 60 years have passed since the Cuban Missile Crisis, but many in our generation still remember vividly the events that brought our nation to the brink of nuclear war. Back then, restoring normal diplomatic relations with Cuba — let alone exchanging goods and services — was unthinkable. While there remain serious political, moral and ideological disagreements between our two nations, a lot has changed since 1962. The numbers speak for themselves. • 100,000 — The number of Americans who visit Cuba each year. • $2 billion — The anticipated value of food products that Cuba will import in 2015. • 6,000 — The number of jobs supported by every $1 billion in U.S. exports. • 90 miles — The distance between the American and Cuban borders. All of this adds up to a tremendous opportunity to boost demand for the products we raise, grow and make here in the heartland through expanded trade with Cuba. With more than $2 billion in agricultural exports annually, Missouri farmers and ranchers continue to feed, fuel and clothe the world. We’re also one of the few states to be a top 10 producer of agricultural goods ranging from corn, cotton and cattle to soybeans, rice, turkeys and chickens. Expanded trade with Cuba is a tremendous opportunity for us to build on this strong foundation, for farmers to add value to their products, and for communities to create jobs across the Show-Me State. Lifting these trade barriers is also an opportunity to extend the reach of our democratic values and ideals. Throughout the world, we have seen examples of how the free exchange of goods and ideas can advance freedom and democracy. That is why, since the president’s announcement in December, we have been committed to exploring ways to open new avenues for competitive trade with Cuba. 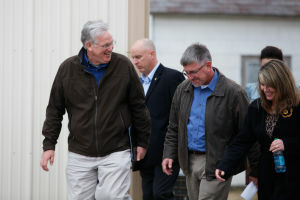 In January, Missouri helped lead the public launch of the United States Agriculture Coalition on Cuba, an organization that now includes more than 40 agriculture groups urging Congress to stand up for American producers and lift the trade embargo with Cuba. In March, we will join leading national and state commodity groups on a trade mission to Havana to make sure that Missouri goods are the first to arrive on Cuban shelves. Lifting the embargo is important because current sanctions force American producers to market their products through a narrow and outdated process that greatly limits their ability to sell goods to Cuban consumers and businesses and puts them at a competitive disadvantage globally. While America is standing down, countries like Brazil, Spain and Argentina are stepping up, significantly increasing their exports to Cuba. Without action soon, the U.S. will continue to be edged out by countries that have less stringent restrictions.